I love New York and I love the food in New York City. I used to live there and not a week goes by where I don’t miss the delicious variety available therein. Any time a friend or family member visits New York my wife and I send them a list of our favorite spots. I’ve been meaning to post the list here for some time, preferrably before our recommendations are too out of date. So here it is, finally. First up, Applebee’s in Times Square! I kid. I kid. Please don’t go there. Our favorite affordable brunch place. It was a 20 minute walk from our apartment so we used to go there on Saturdays. All of the brunch offerings are good. 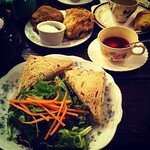 Mariah’s favorite is the veggie sandwich and the Farmer’s Plate. I like their french toast and pancakes best. This is also the location of Mariah’s favorite hot drink in all the city. It’s called the Barnard Bear, “some glorious combination of mint, lemon, apple cider, and butter and it’s to die for.” I usually get the hot buttered cider (pictured) which is also really good. It’s kind of out of the way, located by Columbia University. Ridiculous vanilla bean crème brûlée french toast. I’ve only been here once. I met a group there late because I was actually supposed to be elsewhere for a friend’s birthday brunch/lunch, but I failed to dress appropriately and wasn’t allowed in the restaurant. I still feel badly about my failure to not dress like a slob, but the french toast at Jane was delicious. It’s probably even more delicious when eaten without slob guilt. Expensive, but amazing food. I highly recommend it. Just don’t buy the orange juice (which is awesome, but $9). That is, unless you actually want to spend silly amounts of money on orange juice. It really is delicious orange juice. I am ever so slightly obsessed with orange juice. They’ve got a $20 burger that will blow your mind unless you absolutely hate blue cheese (I am not overly fond of blue cheese, but still love this burger). It’s actually Roquefort cheese, which is a type of blue cheese. Warning: there’s almost always a long wait of an hour or more. I suggest giving them your name and phone number and they should call you when your table is ready. That way you can walk around and maybe find a pre-dinner treat or something. Easily the best inexpensive burger in the city. It holds its own against more expensive burgers. Do not pass this up. Also known as The Burger Joint That Saved Valentine’s Day In 2011. A hole in the wall inside Le Parker Meridien hotel. If, like me, you sometimes (i.e. often) need a super amazing chocolate peanut butter shake, this is an excellent choice. I think the burgers taste like fancy Burger King (i.e. not mind-blowing in my opinion, but I accept that you may be into that sort of thing). If you ever think to yourself, “Self, let’s go to Ray’s Pizza!”, your next thought to yourself should be, “NO NO NO NO NO NO.” Just don’t. Do yourself a favor and eat this delicious pizza instead. More delicious pizza. I think it’s against some sort of New York law to have a list of restaurant recommendations and not include this one. Be prepared for a long wait to get in, even in the dead of winter. This cozy little restaurant in Hell’s Kitchen won’t disappoint. Unless, of course, you’re looking for cheap, greasy American pizza. If that’s what you’re looking for then go somewhere else. This place has an authentic Italian feel to it and the pizza fits the vibe. The staff even let us hang out afterwards without pressuring us to leave. I felt a bit like I was back in Italy. 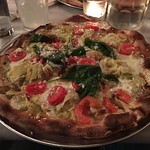 I ordered and very much enjoyed the Artichoke Pizza. The Euro pizza was also good. Went here once and had a good experience. Good traditional New York pizza. Seriously, this stuff is amazing. Mariah likes the Mediterranean best (it has spinach and goat cheese) and I like the Buffalo chicken. S’Mac is better, but this is a good second. Fancied up comfort food with pretty good mac & cheese. I don’t recommend the chicken and waffles unless you’re really into that (I’m not). +1 if you’re into deep-fried Oreos. The name doesn’t lie. The tacos are legit amazing. I go here every chance I get. Don’t be deterred by a line out the door. The line moves quickly and it’s worth the wait. They even sell breakfast burritos in the morning before they officially open. Cash only for breakfast burritos. I’ve only been to their location on 43rd, but I assume and hope their other locations are also amazing. An excellent selection of veggie side dishes. Mariah would often just order 3 or 4 sides and make that her meal. I’d usually get the salmon, trout, or maybe a turkey burger with avocado. 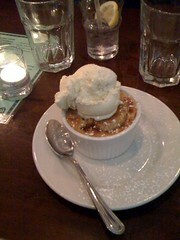 I’m a fan of the mixed berry cobbler (pictured), but our favorite dessert is their strawberry rhubarb pie. It is glorious. The sweet potato fries are among the best I’ve ever had. Once, Mariah made the mistake of not ordering sweet potato fries. She grabbed one of mine, dipped it in the chipotle mayo sauce we were trying for the first time, and took a bite. And then she was gone. The entire world had disappeared—there were no sounds, no husband, no cousins, and no waitress. There existed nothing save her, the sweet potato fries, and the chipotle mayo from heaven. I waved my hand in front of her face and ate her food, but to no avail. I was nothing. Finally, in a desperate and risky attempt to bring her back to the land of the living before both her and the fries disappeared into the void between the worlds, I placed my hand over my fries. I will never forget the look I got. It actually wasn’t what you might think. It was not a face of anger or malice, but instead a face of pleading so pure that it could not be denied. I relented. After that she remained, thankfully, on earth. And I was able to eat some of the fries. Fantastic sushi at good prices. You won’t regret it. Really. A large variety of tea including 30 different kinds of herbal tea, the most amazing scones (especially the pumpkin scone), and delicious little sandwiches (especially the chicken, apple, and goat’s cheese one). To men who think they’re too manly for a tea house or some other nonsense: Man up. This place has delicious food. Amazing, though costly, Japanese food. Mariah says, “I ate the best Kobe Beef of my life here and it was worth the silly amount I paid for it.” This place is as close as we ever got to the real deal outside of Japan itself. They even have a fancy toilet in the restroom. Call in advance because it might not be worth the cost if you don’t get to sit at the grill. Don’t get the gyoza. It was weird. They’ve also got some decent truffle mac & cheese. If you have difficulty hearing other people in loud environments, you may want to avoid this one. It’s famous for dessert, but the food is really good too. I recommend their BALT (BLT + Avocado) sandwich. We also like their bacon mac & cheese, chicken satay, and spicy chicken & 3 cheese pizza. If it’s cold, Max Brenner has delicious hot chocolates. Way better than what you can get at Starbucks for about the same price. Tasty Vietnamese sandwiches near Madison Square Park. This is the best Italian food Mariah’s had in the city and it isn’t too pricey. Really good Greek food close to the theater district so it’s a good place to hit up before a play, but it’s far enough off the main path that it isn’t over-run. Indian fast food. Quite delicious. Especially good if you’re in a hurry or need something to go. A little hole in the wall that churns out delicious crepes. Way out of the way, but if you happen to be in the neighborhood be sure to stop in. Good crepe place near the north west end of Central Park. They make unholy cookies. The chocolate peanut butter cookies are my favorite. It’s entirely plausible that they’re the world’s best chocolate peanut butter cookies, ever. Remember Lembas from The Lord of the Rings? Were it not for the nutritious aspect of Lembas I’d be entirely confident that J.R.R. Tolkien saw the future and based Lembas on the cookies made by Levain Bakery. Our favorite self-serve frozen yogurt shop. We frequented it frequently in the summer months and occasionally in the winter because it’s that good. Update April 2015: This place has been closed. I’m so sad. Italian filled donuts… filled with stuff like raspberry goo or crème brûlée, not Italians. They also have gelato. I think of this place at least once a month, if not more. This is a really fun restored 1920s pharmacy complete with sodas, jerks, milk shakes, and other delectable edibles. 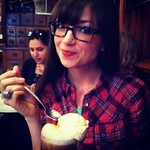 You simply can’t go wrong with a root beer float made by a real jerk. If Mariah and I had gotten married in New York we would have done a reception or something here. Weirdly awesome cookies, cereal milk soft serve (which I didn’t like, but has to be tried), cakes, truffles, pie, and more. Really good banana pudding, but the cupcakes aren’t as good as those that can be found at Crumbs. Lots of good dessert choices. Try their hot chocolate if you’re there in the winter. 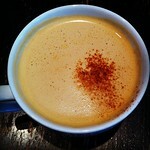 It’s way better than what you get at Starbucks and costs about the same. There isn’t a lot of good Mexican food to be had in NYC. This truck does a pretty good job. Update: I have no idea if she’s still there. Excellent authentic tamales. Not a food truck. It’s just her (or a friend or family member) with a big pot and a cooler hanging out in front of the Mexican Embassy. Her arroz con leche is also particularly good, though you probably shouldn’t spill it on your phone like I did. I never found this one, but Mariah did and very much enjoyed the grilled cheese sandwich she obtained there. 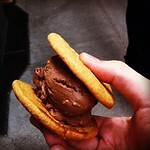 Nutella almond ice cream smashed between snicker doodle cookies, among other things. I can’t find a link for this one, but it was usually in the Financial District and had a sign that said… ‘Thai Pot Stickers’. They were excellent. A collection of food trucks that congregate around baseball and soccer fields, specializing in food from various Latin American countries. It’s been years since I visited this place, but what I remember was lots of delightful food. Some of the Yelp reviewers say it’s gone downhill under the oppressive thumb of government regulation and bureaucracy which, if true, is a food tragedy. It’s very much out of the way. You can get there by taking a ferry to IKEA (free on weekends) and walking for a short spell. This place is a conglomeration of stores and eateries. We highly recommend Ronny Brook’s milk bar (milkshakes), Amy’s Bread (cupcakes, cake, and bread), Jacques Torres (amazing cookies), and Witchcraft (brownies). A conglomeration of Italian food stores and eateries. If you happen to be in NYC near Christmas time, go to all the Christmas markets. You’ll find good shopping and fun treats. Clearly, this is more than can be done on one vacation and it barely scratches the surface of delicious things to be ingested in NYC. But I feel compelled to include a lot of choices in the hope that you’ll pick at least one or two things that sound good to you and avoid the tourist traps like Ray’s Pizza and other horrible, but popular establishments.